One of the most pleasant album surprises I got last year was Uncertain Vista, the debut album from Ottawa outfit Sills & Smith. 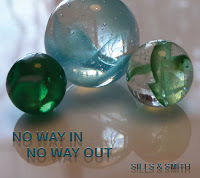 Now the group is back with their sophomore record No Way In, No Way Out. In a lot of ways this record picks up right where the debut left off. The songs are vibrant, with dynamic swings in the arrangements. Commanding bass lines and (*gasp*) guitar solos help form a style that is a vague throwback to '90s alternative rock. There's a darker mood on this record. The themes of songs like "Open Season On Love" and "I Can't Reach You" convey a despair that nudges the boundary of hopelessness. Sills & Smith manage to do that using the full spectrum of rock. On one end is the stripped-down introspective "These Ghosts". On the other end is "Pain", and ominous number that has an Alice In Chains feel, though not nearly as heavy. Sills & Smith has a pop sensibility that, while not dominant, creeps into several of the songs. The results are hooky midtempo numbers like "I'm Right Here", which features a John Cale-esque growl, and the Dan Wilson-ish slice of life tune "Saturday". With a bulky 15 tracks however, there are the inevitable lulls. Tracks like "Life In Miniature", "Would It Be Different? ", and "Radiance" simply don't hold up in the context of the rest of the record. The lyrics can tend to be repetitive as well. Sometimes, like on the catchy "It Doesn't Matter", it works. On other occasions, such as "Clouds", it becomes a grating trait. The album closes with the title track, which features two seemingly divergent concepts that play off each other with unexpectedly solid results. A bold arrangement swells and crashes up against melodramatic vocals, reminiscent of '80s acts that try too hard to be creepy (see: Gowan). In the end No Way In, No Way Out is not as consistently strong as the debut album, but it is still a treasure trove for indie music fans who love some rock in their diets. Best tracks: "Saturday", "I'm Right Here"